30th Anniversary Party Celebrates Grace Ridge, Then and Now - Grace Ridge Retirement Community - Morganton, N.C.
Dr. Jean Ervin’s vision of establishing a retirement community in Morganton began in 1978, but her labor of love didn’t become a reality until nearly a decade later. Since opening its doors in October 1987, close to 800 people from all over the world – from artists and educators to military leaders and executives – have called Grace Ridge home. 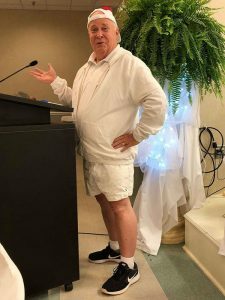 Throughout 2017, we celebrated 30 years of Good Moods, Good Times and Good Life at Grace Ridge, culminating with an anniversary party on Oct. 13 that honored residents, staff and friends – past and present. 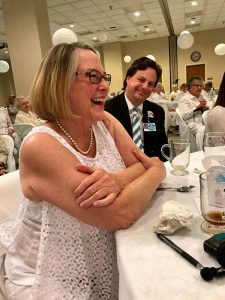 Traditionally, pearls are used to help commemorate a 30-year anniversary. Our Life Enrichment and party planning team kicked that idea up a few notches with a white-themed party that combined fun, reminiscence and elegance. 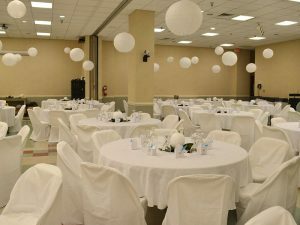 Donning their white attire, more than 100 guests walked into an Ervin Community Room that had been transformed into a sea of white – linens, flowers, pumpkins, hanging tissue pom-poms, table settings, chair covers and party favors. 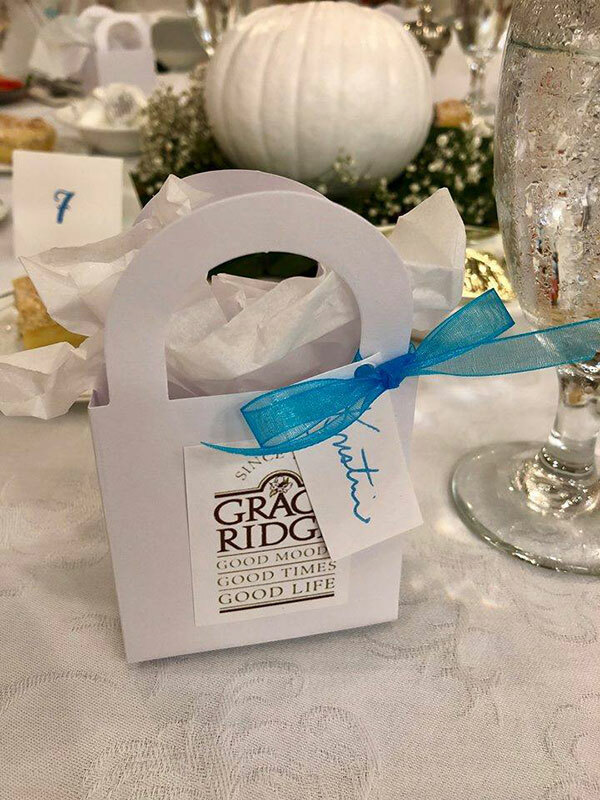 “Tonight, we not only celebrate 30 years of a building or a community, we celebrate the people who have lived at Grace Ridge and those who serve here and have been inspired by our senior friends,” said Executive Director Brenda Yost. Master of Ceremonies Jerry Davis kept the nostalgia and laughs flowing throughout the evening while proudly wearing a pair of white shorts that dated back to his college days. 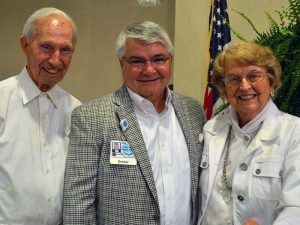 Also speaking at the party was Dr. Edward Plyler, who has served as Grace Ridge Medical Director for 30 years. 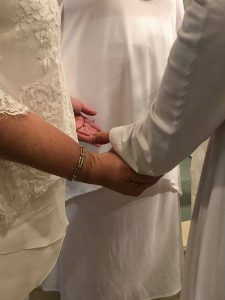 “It’s been a pleasure being here since the beginning …. 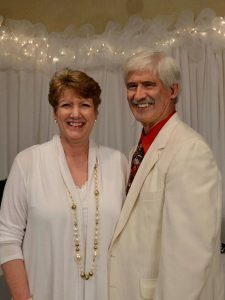 when Grace Ridge was just a gleam in everyone’s eye,” he said. The evening’s spiritual turn continued with Tony and Nikki Glenn’s performance of “Down to the River to Pray,” followed by a Blessing of the Hands by Dr. Don Robb. 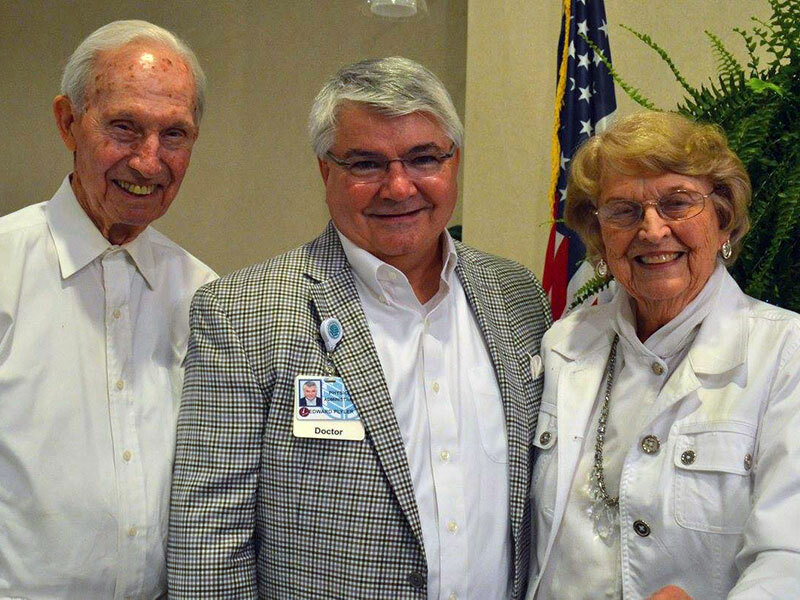 The retired Presbyterian minister and original inspiration behind Grace Ridge’s wellness program said the retirement community is comprised of two equally important groups: compassion and vision. Wrapping up the evening’s festivities, Life Enrichment Director Evelyn Beaver recognized those who make up the heart of Grace Ridge: dedicated and compassionate employees who help the community continue to grow and thrive. 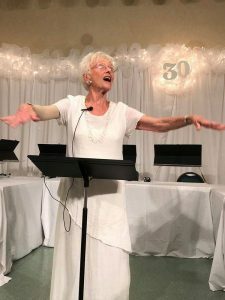 It was a fitting end when the Glenns headed back to the stage to lead a performance of “We Are Family” – one last act of fellowship that brought everyone to their feet and capped off a year of reveling in good moods, good times and good life.